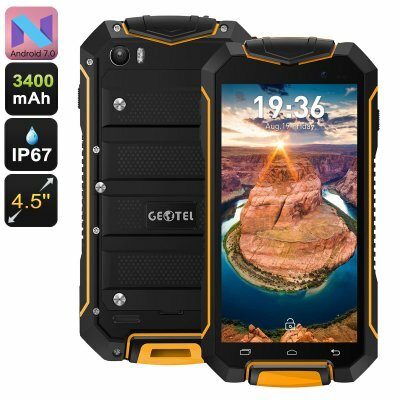 Successfully Added Geotel A1 Rugged Smartphone - 4.5 Inch Display, IP67, Android 7.0, Quad-Core CPU, 8MP Camera, Dual-IMEI, 3400mAh (Orange) to your Shopping Cart. The Geotel A1 rugged phone is the perfect Android phone for all outdoorsmen and nature lovers out there that like to head out into the wild while, at the same time, stay connected to friends and family back home. Thanks its fully rugged IP67 design, this rugged smartphone is extremely durable and resistant against water, dust, drops and more. No matter where life will take you and how tough the environment gets, this rugged phone will never let you down. Within its rugged design lays a beautiful 4.5-Inch display on which it allows you to enjoy all your favorite media no matter where you are. Playing games, watching movies, and using the latest mobile applications – with this Android phone at your side you’ll never have to be bored again. Running on an Android 7.0 operating system, this Chinese smartphone comes packed with the latest features the mobile industry has to offer – guaranteeing to bring along a smooth and powerful performance. Along with its quad-core CPU that has been clocked at 1.3GHz, the Geotel A1 is a rugged phone that lets you enjoy demanding games, applications, and movies without dropping a frame. Simply slide it in your pocket and carry along this rugged phone whenever you’re heading out and embarking upon your next outdoor adventure – with the Geotel A1 you’ll always be able to enjoy the most demanding of mobile media and entertainment no matter where on the globe you’ll be located. With 8GB of internal storage and 64GB of external data support, you can be assured that this rugged Android phone always holds enough storage for you to save all your files and media alike. With its epic 3400mAh battery, this Android 7.0 smartphone packs enough juice to get you through 6 hours of continuous usage time. Additionally, this powerful battery brings along 120 hours of standby time - allowing you to head out into the wild with confidence as running out of battery will be an issue of the past with this Chinese smartphone in your pocket. Whilst out in nature, the phone’s intergraded 6MP rear camera lets you snap sophisticated pictures and video’s, assuring that not a special moment during your upcoming trips and adventures will stay uncaptured. Featuring two IMEI numbers, this rugged smartphone allows you to be connected to two network providers simultaneously, immensely increasing your overall connectivity. Added to that, dual-IMEI phones furthermore let you be reachable on two different phone numbers while using merely one device – making them perfect for separating work and private life. No matter where your next adventure will take you, this Android phone will always keep you connected to your friends, family, and loved ones back home.